This is one you are going to want to try. I expect most of us love the idea of using edible flowers in lovely little food items and this may be the easiest idea around. In this “recipe” it’s all about that chocolate and some eye-popping spring flowers. We used violets and dandelions. Using flowers in the blue/purple range in combination with flowers in the yellow/orange range puts flowers opposite in the color wheel right on top of your candy making it especially eye-popping. You could also use white chocolate instead of dark chocolate. You could even color the white chocolate (and here’s an inspiration photo at Paper n Stich) but coloring white chocolate gets a bit fussy unless you use those pre-colored chocolate disks and I find that’s putting a little toe into the “dark side” because of the artificial color. Of course, we put toes there on occasion anyway so you may decide to do so on this project. The Half Pints discuss the candy in the video here. 1/2 cup of edible flower petals. Melt the chocolate and coconut oil together in a double boiler. Stir the mixture well as it melts. Pour the mixture onto a cookie sheet. 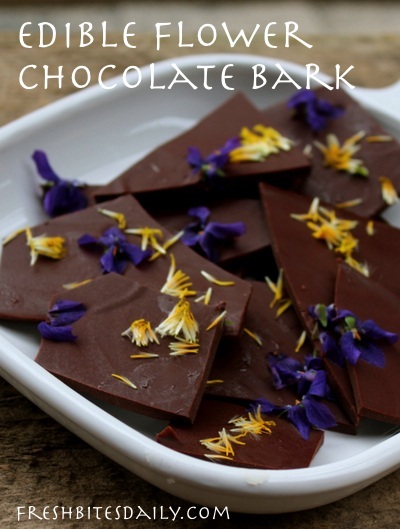 Before the chocolate hardens, place and/or sprinkle your petals on the chocolate. Allow the chocolate to set up. Depending on your room temperature, you probably want to set it up in the freezer or refrigerator. We set up our candy in the freezer and a big advantage is that the flowers stay lovely. You could make these several days in advance of a special event and have some great-looking candies to offer your guests.